This is the second piece by guest columnist Peter Offermann, on the Crisis Management Institute (CMI) pdf document puzzle. FOTM is grateful to Peter for giving so generously of his Internet technical knowledge and analysis. Here is the first part of Peter’s analysis: “An Analysis of Anomalies on ArlingtonLocalSchools.com (Part 1),” Jan. 22, 2013. For the background on the CMI document, see “Guide on how to talk to children about Sandy Hook 4 days BEFORE massacre,” Jan. 16, 2013. 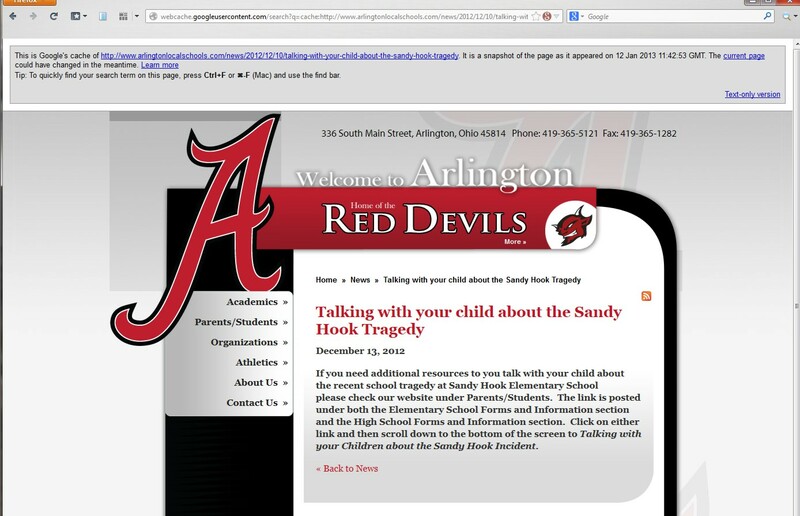 For FOTM’s other posts on the massacre, go to our “Sandy Hook Massacre” page. The school these police officers were running into is NOT Sandy Hook Elementary School! 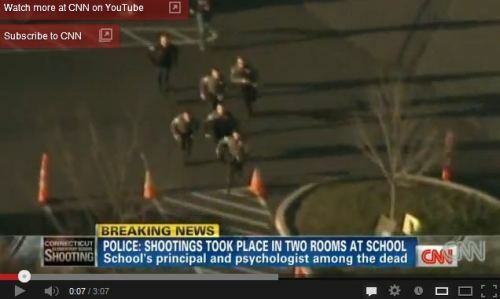 See “CNN deception: Live aerial footage of police running into Sandy Hook was of another school,” Jan. 22, 2013. I will refer to 3 images in this document that show the anomalies in the Google cache records of The Arlington School’s News Items. Document 1 is an image of a Google cache record showing a published date of Dec 10, 2012 which states Google recorded it on Dec 18, 2012. The URL below used to access the page imaged below – it now returns a 404 page error. Anyone that has copies of the image please keep it safe. by selecting to view the page. DOCUMENT 2 below is an image of a google cache record showing a published Date of Dec 13, 2012 which states Google recorded it on Jan 12, 2013. As of this writing, January 25, 6:21pm PT it is still available at the url below. DOCUMENT 3 is an image of a google search return to a document Published Date of December 13, 2013 the same as in Document 2. The link to this page has been disappeared by google as of today. I am going to explain to you in this article how those document came to appear on the internet on the Published Dates shown, December 10, 2012 and December 13, 2012. I will also explain how the search return came into being. In order to do this I am going to ask you to suspend disbelief so you can follow the timeline explaining the documents. Events like 9/11 have demonstrated that news items about them appear almost instantly after such events. Many are complex documents that would be impossible to create in that short a period of time. If someone is preparing a false flag the most effective period to introduce your desired interpretation of the event is immediately after the event while people are still in shock. In order to meet a tight deadline there are many trusted people working in the background preparing documents and then sitting and waiting to pull the trigger and make them public the moment the event is planned to occur. These people are scattered all over and working off their own script with a time to make their information public. 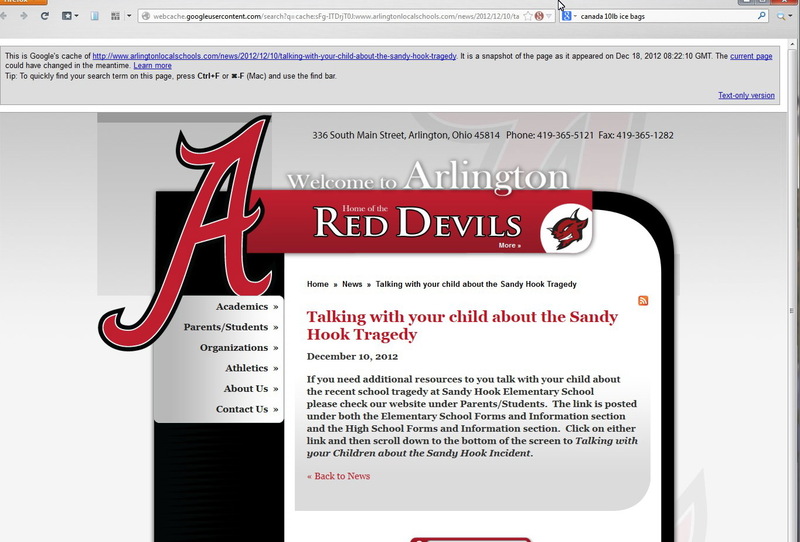 CMI (Crisis Management Inc) which had author permissions on The Arlington School Website as a contractor to upload their material to the website as needed. They could upload, create links to their material, and publish news announcements all from their own offices without anyone from the School being involved. The School shootings that took place in Sandy Hook on December 14, 2012, were originally planned to happen on December 10, 2012. If you check on a calendar you will see Dec 10 was a Monday and a school day so the event could have been planned for that date. Everyone involved with media material had the material prepared referring to the date Dec 10, 2012. On December 10, 2012 someone at CMI was waiting to pull the trigger and publish the news item (Document 1) and related documents such as the pdf the news item announces. For some reason the event was called off at the last moment. Everyone who had planned to submit material was frantically called to NOT submit their material. The message for some reason didn’t get through to CMI in time and they submitted the pdf, created the link to it, and published the news item shown in Document 1 . Google took the opportunity while going to the site to capture the thumbnail of the page seen on the right of document 2 to also put it into their cache database. The above means the article could be found on the Google search engine on that date and also in their cache shown in Document 1. The search record was scrubbed by Google for this Dec 10, 2012 item, but events that took place on Dec 13, 2012 caused an identical entry to be made only with a published date of December 13th. I’m not sure why it wasn’t scrubbed by Google before today. It is shown in Document 3. The Sandy Hook Shooting event was rescheduled to this date and was again scrubbed. It Was a Thursday, also a viable date. It was again scrubbed for some reason. CMI again did not get the word to not publish in time. They published the news item again, on Dec. 13, but this time with a published date of Dec 13, 2012 causing another RSS submission creating Document 3 and also a second cache record (Document 2). 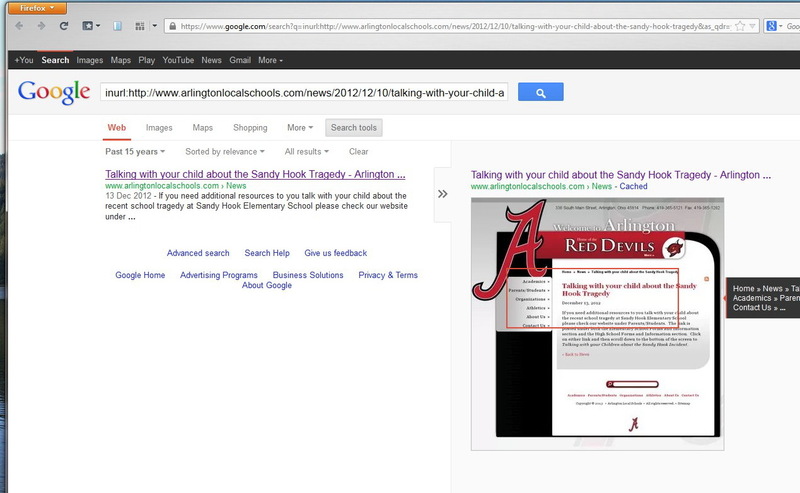 No one in the loop realized there was an RSS feed on the news items at Arlington School and that the 2 pages (Documents 1 & 2) were recorded in the google cache. Some bright Internet users discovered the cache records predating the actual events and all hell broke loose. The people behind the false flag frantically tried to cover up these incriminating cache records and the search return. For technical reasons too complex to explain here, it was impossible to erase the records. Publicly removing the cache document after they were found would also be suspicious. As a temporary fix someone authorized by Google edited the records as below. Document 1, which first read “as it appeared on 10 Dec 2012 or possibly 11 Dec 2012 was changed to read 18 Dec 2012” — a date after the events of December 14th. This document was still suspicious but at least is showed it was recorded after the event it announced. Document 2, which first read “as it appeared on 13 Dec 2012 was changed to read “as it appeared on 12 Jan 2013” — a date after the events of December 14th. This document was still suspicious but at least is showed it was recorded after the event it announced. To make these changes at Google would take no more than about two minutes. All that needed to be done is to select the records in the database and edit the field that holds the date Google recorded the record. Google decided that the evidence implicating them in these events were getting too dangerous to leave available and removed them from public view even though that looks very suspicious. There is an enormous amount of corroborating evidence that I described before at Fellowship of the Minds. If you find the information above compelling enough to look further, and if I survive to tell about it, this discussion will be continued. That Google is currently scrubbing the evidence does not bode well for those publicly explaining it. Although Google can hide the incriminating evidence from the public, they cannot remove the internal traces from their servers. We who made screencaptures and didn’t clear our browser histories have evidence they existed to the last date we accessed it. Guard that information well. I am going to stop here to let you consider what I said. Peter continues to make his case that the CMI was uploaded online BEFORE the massacre, as a prosecutor would in a criminal trial. Please go to our technical discussion thread about this post, “Sandy Hook Massacre: The People v. Crisis Management Institute,” by clicking here.